Saturday evening at the Emirates will be a new experience for many. For the fans in the stands, it is the first time any will have seen Arsenal play Chelsea at the 60,000-seater stadium without the sight of Arsene Wenger in the home dugout. For the man who replaces him and his counterpart in the other technical area it is a brand-new experience. The same can be said for a number of those taking the field in what has become one of the iconic games of the English Premier League. Despite the lack of familiar faces, the game is not without narrative. Coping with the departure of Wenger was never going to be easy, even with the best of intentions and clear succession planning, these things are inevitably more difficult once they actually happen. The case of Sven Mislintat is a case in point. The German, who is well regarded across the football world, is leaving the club after his expectations of becoming technical director diminished. The former Borussia Dortmund talent spotter and developer was expected to take charge but changes in the boardroom have seen an end to that and Arsenal's post-Wenger rebuild remains a state of flux. It is not much better on the pitch now. Arsenal lost 1-0 to West Ham United last week. It's almost a month since they were taken apart 5-1 by Liverpool after opening the scoring at Anfield. Despite wins in between, it has been a tough month for the club in the Premier League. Arsenal are now fifth in the league, level with a resurgent Manchester United side that have made up eight points since Ole Gunnar Solskjaer took over from Jose Mourinho in December. Chelsea are in fourth, six points ahead of Arsenal and odds on for the Champions League spot that is the very minimum expectation of the clubs that make up English football's so-called "Big Six." Wenger's replacement Unai ­Emery was tasked with getting the team into the top four and that now looks all the more difficult, despite what appeared like a strong start to the season, their first without Wenger in charge in over two decades. The fear for Arsenal is that the Jekyll and Hyde nature the team has displayed in matches, where they often improve dramatically after half time, will be reversed in the season itself and they will have a bad second half to the season after largely keeping pace with the top four prior to Christmas. Then there's the Mesut Ozil dilemma, where the club's highest-paid player is no longer the first name on the team sheet and is more often the first name on the bench. It is arguably a must-win for Arsenal. If they fail to take three points then that allows both Chelsea and Spurs to gain ground ahead of them and the newly motivated Manchester United to claw back the deficit. That puts the pressure on Emery and his side in this first meeting between the clubs at the Emirates without Wenger in the home dugout. If that is the end of an era then there are other signs that times are changing in the rivalry. This will be the first derby in some time not to feature Cesc Fabregas after the Spaniard left Chelsea to sign for former Arsenal teammate Thierry Henry at Monaco. Fabregas proved the difference in this derby in both the red and white of Arsenal and the blue of Chelsea over the years, but he was allowed to leave Stamford Bridge for the south of France. 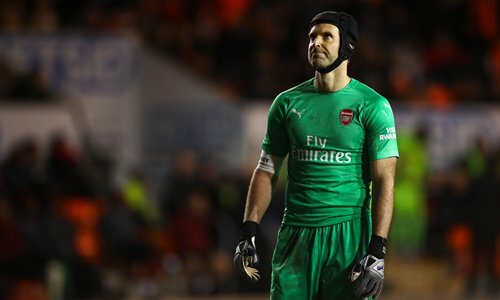 Another star of both sides, Arsenal goalkeeper Peter Cech, has announced that he will retire at the end of the season. The Czech stopper was as vital to where the points ended up as Fabregas for the last decade. With these changes, the atmosphere has changed. It has certainly moved on from the rivalry under Wenger and Mourinho during both of the Portuguese coach's stints at Stamford Bridge and the frisson of friction created by crosstown moves from Ashley Cole and William Gallas. The supporters might retain the enmity of the era but there's no doubt that the fact the teams are not competing for titles but a Champions League spot has taken some of the bite out of the fixture. There is also an absence of the absurd number of goals served up on the pitch in the form of Arsenal's bananas 5-3 away win at Stamford Bridge in 2011 and a 6-0 hammering for the Gunners on Wenger's 1,000th game in charge of Arsenal in 2014. Neither Emery nor his counterpart in the away dugout Maurizio Sarri will even be thinking of their 100th game in charge of the clubs they joined last summer. While the North London club's troubles are clear, it's not much smoother in West London. Off the pitch, they are understood to be for sale with Russian chairman Roman Abrahamovic looking to get out of his British business interests. On the pitch, it is a period of transition under the stewardship of the former Napoli manager. His decision to let Fabregas go was in large part because he has built the team around his former Napoli midfielder Jorginho who followed him to Stamford Bridge. Jorginho has impressed but he has also not contributed an assist despite having the most passes in the league. His positioning at the base of the midfield has meant a different role for N'Golo Kante, one that has attracted much comment from the media and supporters. Further forward, Alvaro Morata has failed to find the net often enough to be surplus to requirements and the Spaniard is on his way to former side Atletico Madrid. That move will mean another of Sarri's former Napoli players, Argentina striker Gonzalo Higuain, will follow him in the door. Saturday's result could yet decide which one of these new bosses is next out of it.